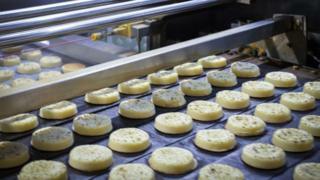 The UK's largest producer of crumpets, Warburton's, has halted production at two of its four plants. The firm has run out of carbon dioxide which it uses to package the product. The CO2 scarcity has already forced beer, fizzy drink and meat firms to curb production. Warburton's supplies 1.5 million crumpets a week to UK consumers, packaged using carbon dioxide to give them longer shelf life and prevent mould. But plants in London and Burnley have run out of CO2 and supplies at the company's Stockton site are intermittent. "We have had quite big shortfalls," said Tearmh Taylor, a spokeswoman for Warburton's. "We're probably running at about 50% of what we can normally make" she said. Only the Midlands plant is operating normally and the firm doesn't know when supplies will resume. Their supplier said it could be next week but have had no confirmation. Meanwhile, the British Beer and Pub Association (BBPA) said brewers were "working their socks off" to keep the beer flowing. "If a similar issue were to affect the water industry... then you feel government would be acting with far greater urgency," the Food and Drink Federation said.. However, several UK and mainland European producers of carbon dioxide - a by-product from ammonia production that is used in the fertiliser industry - closed for maintenance or scaled down operations. The shortage comes at the same time demand for food and drink is soaring. "The football, the weather, the BBQs have created the sort of demand for beer we only see at Christmas," one big UK brewing company told the BBC. Brigid Simmonds, chief executive of the British Beer and Pub Association struck a reassuring note: "Although stocks of bulk CO2 remain low, brewers across the country are working their socks off around the clock to ensure there is still plenty of beer to go around. "The UK can produce as much as 10 million pints of beer per day, and with signs of things improving, pubs will certainly not be running dry. "Our message to beer drinkers and England fans is clear: Keep calm and carry on going to the pub. If your usual beer of choice isn't available, then why not use it as an opportunity to try something new?" These assurances come after big pub chains in Wetherspoon and Ei Group reported they had temporarily run out, or were short of, brands including John Smith's, Strongbow, Amstel and Birra Moretti in the run-up to Thursday evening's England match against Belgium. Scotland's biggest abattoir closed this week until further notice, and meat processors are considering shortening "sell by" dates because packaging will contain lower levels of CO2. There have been concerns about animal welfare if animals don't go to slaughter at their usual rate. "The last few days have alerted the country to how dependent we are on CO2," Nick Allen, chief executive of the British Meat Processors' Association, told the BBC on Thursday. He criticised CO2 producers for a lack of information about when carbon dioxide supplies might return to normal. "It makes planning difficult," Mr Allen said. The British Poultry Council said its members continued to live "day-to-day" as they tried to stretch out their dwindling supplies of the gas. "They are not telling us, which means we can't plan," said Richard Griffith, from the British Poultry Council. The Department for Environment, Food and Rural Affairs, and the Department of Business both said they were monitoring the situation. However, the Food and Drink Federation said ministers should really be on the "front foot" over what could develop into a major food supply issue.